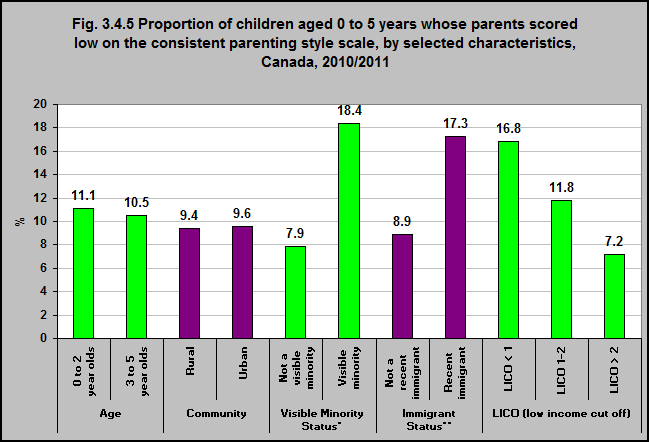 Children living in low income were more likely to have parents who scored low on the consistent parenting*** style scale in 2010/2011. That was also the case among children who were part of visible minority groups and recent immigrants. There was little difference by age or community (rural/urban). ***The National Longitudinal Survey of Children and Youth (NLSCY) and Survey of Young Children (SYC) measure consistent parenting by looking at parental behaviours such as setting clear and consistent expectations, and using non-punitive consequences with regard to their child’s behaviour.